Of all the contrasts in perspective between children and adults, none is more striking this time of year than in how we view autumn leaves. For children, leaves are a crisp sound underfoot, a source of beauty in color and flight, a gift from above to revel and play in. For many adults, that joy and gratitude mutates into resentment and complaint. Glorious leaves become an unwieldy burden called “yardwaste”. There is plenty of adult logic to suggest that the child’s view is less naïve. 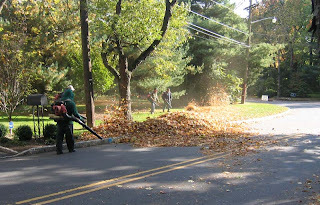 Each time leaves get piled on the curb for pickup, the urban soil becomes less fertile, less absorbent, less hospitable to birds and other wildlife. The yard’s loss then becomes a public hazard, obstructing traffic and polluting local streams with nutrients. The CO2 spewing from battalions of leaf blowers, and the municipal convoys that scoop up the leaves and haul them out of town, hastens spaceship earth towards the tipping point of ecological havoc. But I can understand why people grow resentful. Trees, in their own quiet but relentless way, are ongoing critics of our way of life. They are constantly dumping some sort of detritus on our patios, our houses, our idle lawns. Whether it's spent flowers in spring, seeds and sticks through the summer or dead leaves in the fall, the message is clear. Trees are predisposed to bury our coiffured human habitats and bring back a cool, moist forest floor into which they can spread their roots. It’s best not to take this personally. And though our adult bodies may not be ready to leap into a pile of leaves for the sheer pleasure of it, there are ways to smuggle into adulthood a child’s gratitude for leaves. To get along with nature, and to sustain hospitable conditions on our one and only spaceship, it helps to work as nature works, by finding opportunity in discarded things. Nature has no landfills. All “stuff” travels in an endless circle, from life to death and back again. Think, therefore, of your yard not in terms of leaf exports and fertilizer imports, but as an economy unto itself, where plants extract nutrients from the soil, then send them dancing back down again as spent leaves to replenish the soil and all the life it holds. To accommodate autumn's harvest in our tidy urban landscapes, become a connoisseur of leaves. For each type there is a strategy. Pine needles make an attractive mulch under shrubs and trees. Locust leaves are so small they require no raking at all. Silver maple leaves curl up and quickly decompose, so can be raked into flower beds or ground up by the lawn mower and left on the grass. Oak leaves, being thicker and longer lasting, will need to be corralled in a corner of the lot to settle back into the earth over time. Children may push their vegetables away, but they know a thing or two about appreciating leaves. For the leaf-spurning adult world, it’s worth taking a fresh look at autumn’s harvest. Surely there is some measure of happiness to be regained when a foe becomes a friend, when the eye sees not burden but opportunity falling all around. More information can be found in the Fall Leaf Management brochure, published by the Princeton Environmental Commission, available at town halls and downloadable from www.princetonboro.org. 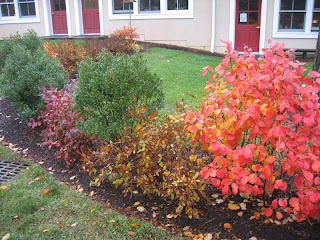 A fine example of using native shrubs in a foundation planting was in its fall glory at the Princeton Junior School earlier this month. The yellow is sweet pepperbush (Clethra alnifolia). 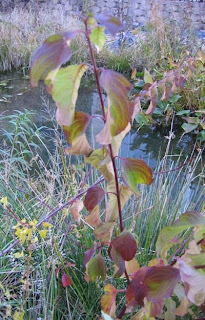 Virginia sweetspire (Itea virginica) is burgundy, with a bit of blueberry (orange) in the lower right. Dwarf witchalder (Fothergilla gardenii) is the dazzling orange in the second photo, with Clethra to the left, then the evergreen inkberry holly (Ilex glabra). Another holly in the planting, not shown, is winterberry (Itea verticillata). Most of these shrubs are rarely found in the wild (Fothergilla does not even include NJ in its natural range) but grow easily in gardens. 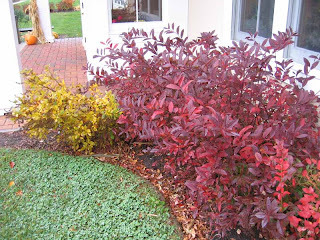 The colors are particularly brilliant because these shrubs get a good dose of sun, but they'll do well even when planted in mostly shade. The rainbarrel, by the way, is connected to soaker hoses that run through the planting, and actually provided some decent water pressure for the attached hose and spigot. There's a screen on top to filter the water and keep out mosquitoes. 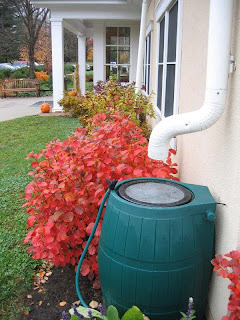 Most rainbarrels, this one included, are way undersized when compared to how much water pours down a typical downspout. 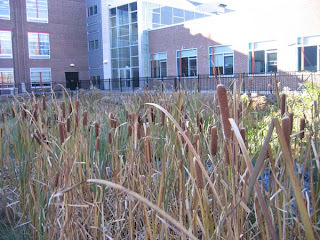 From the outside looking in, the Princeton High School wetland ecolab looks pretty spent, as it should by the end of October. But a few flowers are hanging on. 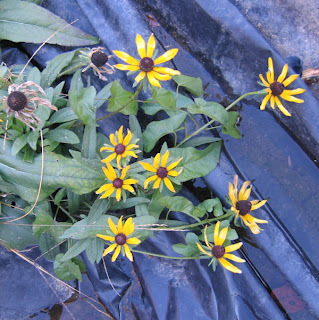 This post's second photo is of native black-eyed susan blooming on top of black plastic laid down to contain weeds in some areas. Third photo is of Helianthus tuberosa, a.k.a. 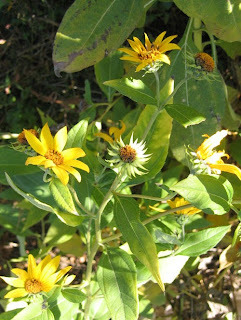 Jerusalem Artichoke--a strangely named native sunflower whose tubers were eaten by American Indians. It's now grown as an edible ornamental. 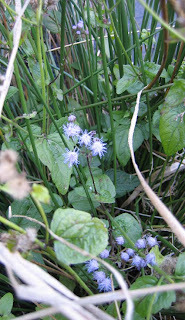 The pale blue flower in the fourth photo is mistflower--a native perennial that looks like an exotic annual that's sold at nurseries. 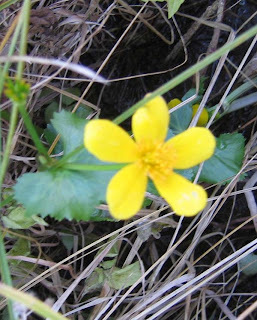 Though most flowers are lingering from the summer, the fourth photo shows marsh marigold, a spring bloomer that the weather apparently fooled into blooming in the fall. 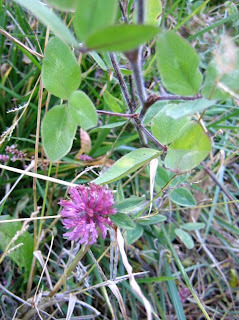 In the fifth photo, red clover, a good example of an exotic species that doesn't take over. The last photo shows not a flower but the color of silky dogwood, a native shrub often found in the wild. Some art is not destined for immortality. I was dismayed to find this grizzly scene in my front yard the other day. 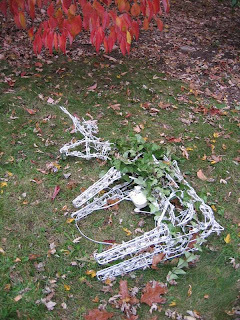 The Ivy Tailed Deer featured in a Halloween post must have had its dinner of native wildflowers rudely interrupted, as its table, dishware and wine were repossessed by budding art critics, unbeknownst to me. This appears to have been an inside job. There's been a noticeable uptick in squirrel graffiti this fall, as pumpkins all over town have been literally defaced, or perhaps refaced. 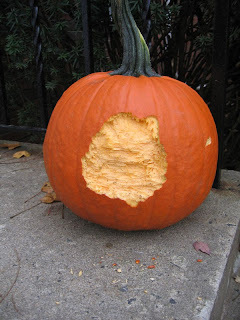 My daughter carved a fine ghost at a halloween party, only to have the ghost consumed the next day by a resident rodent. 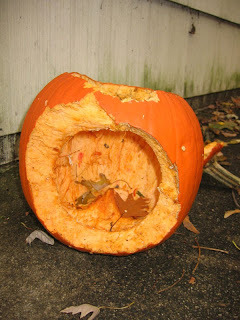 One interpretation is that squirrels have turned their substantial intelligence and expressive range to the art of pumpkin carving. Since they aren't afraid of ghosts, they choose to refashion pumpkins with what they consider to be far scarier images--car wheels and cats, for instance. Thus, the circular nature of their carvings, with something ear-like sticking out on top. Richard Louv's book, Last Child in the Woods: Saving Our Children From Nature Deficit Disorder, struck a chord among many of us who wonder about where the next generation of environmentalists will come from in an age more and more dominated by urban and electronic experiences. Current educational movements like No Child Left Inside owe much to Louv's research and writing. Come hear him speak at the Princeton High School Trego-Biancosino Auditorium at 7:30 this Thursday, Nov. 6. The talk is free and open to the public, and is sponsored by Common Ground and the Princeton Junior School. For more information on Common Ground, go to http://www.princetoncommonground.org/page.cfm?p=57.